This program is designed to take newcomers from dock side to rowing in one weekend. The first session (Friday 6:30-8:30 pm) will focus on safety, the equipment, and the basics of rowing on indoor rowing machines. Session 2 (Saturday 7:00-10:00 am) will be spent in our very stable recreational shells, covering the mechanics of a stroke. Session 3 (Sunday 7:00-10:00 am) will introduce drills to refine the stroke. Upon completion of Learn To Row I, you will be invited to join Learn To Row II or one of the Club’s other programs. It is highly recommended that you practice your new skills for a couple of weeks before signing up for LTR II. LTR I graduates may participate in any of the tours sponsored by the Ontario Adventure Rowing Association. Those joining as annual members will receive an $80 discount. Download a registration-waiver form from the Forms & Documents section. 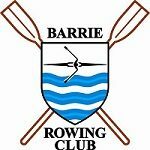 Email completed pages 1 and 2 to info@barrierowing.org indicating your choice of program and dates. You can pay online using the Pay Now button below. Registration and payment by cheque can also be mailed to: Barrie Rowing Club, P.O. Box 29001, Barrie L4N 7W7. NOTE: A $60 non-refundable cancellation fee applies and no refund will be given for cancellations received less than 15 days before program start.